5 a.m is not he ideal time to be stuffing yourself with bread, cereal and pancakes, but a 40 mile coach trip to arrive in St Quentin for the 7.30 am start didn’t really give us much option. By the time we set off, the thermometer was telling us that it was four degrees centigrade, but with a promise of blue skies and warmer conditions for later in the day. Whilst the event gives you something approaching a professional experience, this doesn’t include team cars where you can dump extra layers of clothing as the day warms up, so there was much debate as to what to wear. We arrived at the start about twenty minutes before the first group was going to be released. Gendarmes were unloading moto cross bikes from trailers, and riding them around the start area, standing on the footrests and revving the engines. If the cheesy music blaring over the PA hadn’t already woken up the whole neighbourhood, then they would surely wake up anyone who was still sleeping. It has seemed like a good idea at the time when my pal Richard had blagged us better start numbers, moving us into the third group to set off. As we lined up, I was less sure. Lots of young guys, team bikes, matching jerseys, shaved legs. A slight feeling of being out of my depth came over me. This was reinforced for the first couple of kilometres. There was no gentle warm up, no taking it easy just to get your legs going. The speed was high right from the second we crossed the line. Fortunately I was sticking to my plan –‘slipstream a fat Belgian’. Except there weren’t any fat Belgiians, just fit looking French club cyclists. As we left town the roads opened up a bit, and I found I could move around the group reasonably well. After about 10k, there was a slight rise in the road, and as the group slowed a bit, I found myself getting nearer and nearer the front. I drew up alongside Richard and just said ‘I’m not wasting this’. I moved up and up the line until I found myself on the front of the group. I just stuck my head down and pedalled as hard as I could. It was an amazing feeling – ahead of me nothing but two motorbikes and a French sunrise, behind me a 300 strong peleton, all strung out. It was probably the best moment I’d ever had on a bike. The speed stayed high, but I found that I could stay in the top twenty or so riders without too much trouble, just riding in the wheels of others, sometimes closing gaps as they appeared. We passed a sign saying that we had already covered 20k, and when I looked at my watch, we’d been going 32 minutes. After 38k on rolling roads, and a crazy average speed we arrived in a village called Troisville. I knew this name held some vague memory for me, and then I realised why, as we rounded a bend and saw the first stretch of pave. This was what we’d come for! Nothing, but nothing, can describe the bumping, jarring shaking sensation of hitting the cobbles. It’s almost impossible to hold the bars properly, and even the noise is almost deafening as every part of your bike seems as if it’s about to shake itself to bits. Looking around is difficult, changing gear almost impossible. In the dry, like it was for us, you can at least ride down some of the gutters at the side, but you need to be careful of the huge potholes. The other option is to ride straight down the middle, on the crown of the road, where the stones haven’t been quite so badly damaged by farm traffic. The problem with the ‘gutter option’ is that the other gutter always looks better that the one you’re in, so you spend half your time switching sides, and having to get across the cobbles. All the sections were marked at the start to say how long they are, so at least I had some idea of what was ahead. At the end of the first section, the 300 strong group I was in had completely disintegrated, but there were enough riders around to get into a fair sized group and keep a decent speed up. This was how the ride continued – every group I got in seemed to work together quite well, and I started to notice that I was seeing the same people time after time. Each section of pave broke groups up, but there was always another group to join. Then, on a fast straight bit of road when I was in a group of about 15, someone shouted ‘Arenberg, Arenberg’. I looked ahead, and could see a long avenue of high trees with a huge gantry high above. 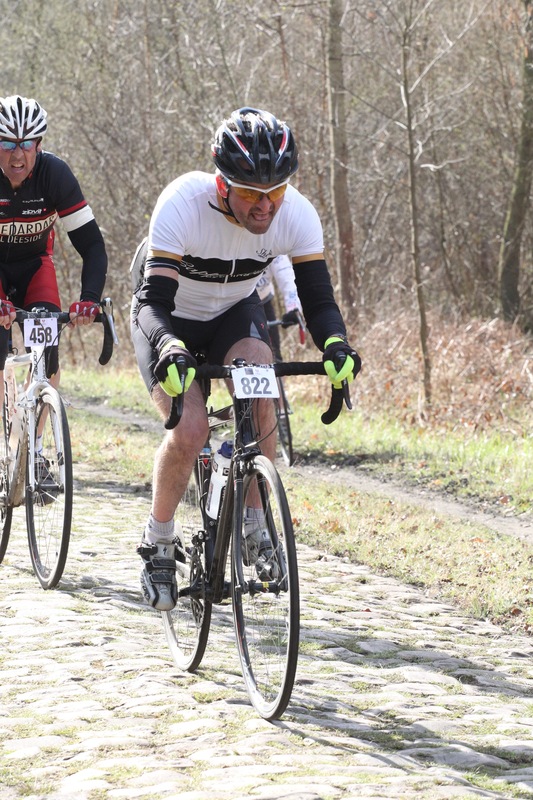 I recognised it from hundreds of old cycling magazines and films – one of the most famous bits of road in the history of cycling – the Arenberg forest. All of the group looked at each other nervously, and the chap to my right, on a very nice steel Colnago told me it was best to try to stay to the right, because the road was better there. Hitting the cobbles here made everything that had gone before seem easy. It was as if someone had laid a dry stone wall flat, and called it a road. I’m sure its a lovely place for a bike ride, as there’s even a nice cycle path down one side, which the organisers had thoughtfully cordoned off to ensure the authenticity of our experience. I rode some of it in the gutter, but made sure the photographer got me when I was riding straight down the middle of the road. There was quite a bit of celebrating at the end of the Arenberg, before the routine of getting into a fast group to make up time was resumed. I never saw a sign for Roubaix, but there were signs counting off each 20k that we had covered. At the last feed I downed a couple of cokes and a banana, and a nice chap in a beret told me there was 30k left to cover. I never saw a sign for Roubaix in all this time, but noticed that the cobbled sectors had counted down to just one to go. I recognised the long straight run towards the velodrome from seeing it so many times on television. Its actually quite a steady climb, but I was so full of adrenaline that it didn’t seem to matter. I saw one large building which looked like a stadium, but realised that it was too modern to be the velodrome. Then, over the rooftops I could see the floodlight pylons, again familiar from my youth. There’s one last piece of token cobbles on the approach to the velodrome, which just made me think of Eurodisney for some reason, Probably because it just seemed so artificial. Then a right turn, a long sweeping left, and the entry to the velodrome itself. I must admit I was pretty overwhelmed thinking of some other people who’d ridden that very bit of road. Not just the modern generations of greats like Boonen and Cancellara, but so many other names ran through my mind – Museuw, Kelly, Hinualt, de Vlaemick, Merckx, Coppi………and now me. I’d ridden the last few kilometres entirely on my own, which meant I got the chance to fulfil a boyhood dream. I rode into the stadium completely alone. I could hear the commentator on the PA, and enjoyed the brief applause of people lining the entrance, all probably eagerly awaiting someone they knew. Another surge of adrenalin and emotion helped increase my speed as I came into the final straight. I’d lived this moment many times as a boy, so I knew what to do….Pull jersey straight, adjust glasses to the right angle, sit up, lift my arms and coast over the line. 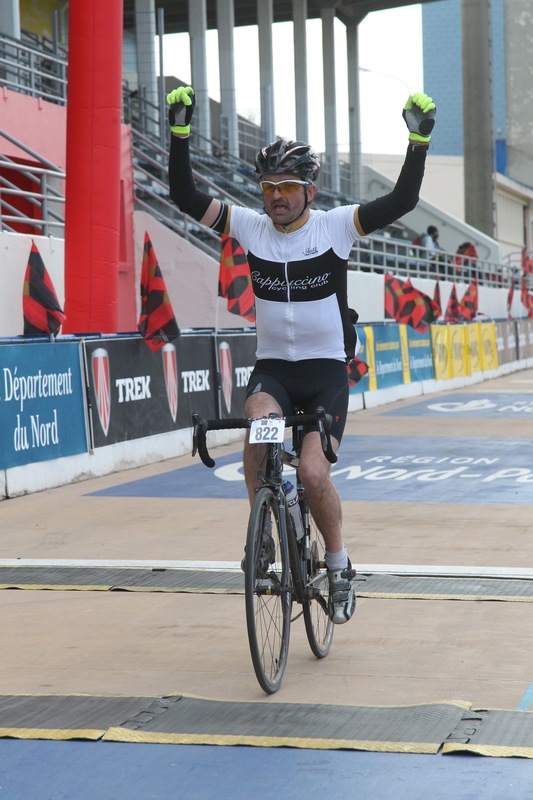 This entry was posted in Ride Reports and tagged paris roubaix. Bookmark the permalink.